A traditional view of mammalian evolution was that the group was diphyletic, that it had two ancestral lines, one leading to the 'therians' and the other to the 'prototherians'. 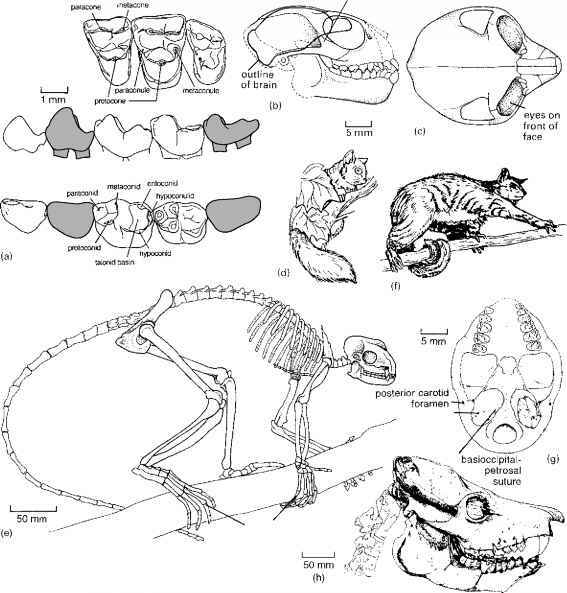 The 'therians', those forms with a triangular array of cusps on the molars, included Kuehneotherium, the symmetrodonts, marsupials and placentals. The 'prototherians' had the molar cusps aligned and included the morganucodontids, docodonts, triconodonts, multituberculates and monotremes. A second line of evidence for this view concerned the side wall of the braincase. In monotremes, multituberculates and morganucodontids, most of the side wall is made from the anterior lamina, an expansion of the periotic (prootic) bone (see p. 299), whereas in marsupials and placentals the expanded alisphenoid (epipterygoid) takes this role (see illustration I)). The first cladistic analyses (Kemp, 1983) disproved this view and confirmed that 'prototherians' are not a clade, and that monotremes are more closely related to marsupials and placentals than Morganucodon. The linear alignment of tooth cusps in Morganucodon, multituberculates, docodonts and triconodonts are primitive characters that do not indicate close relationships to monotremes. Further, the braincase evidence does not support a major split within the Mammalia. The side wall of the braincase in embryonic monotremes is essentially the same as in embryonic marsupials and placentals. A similar thin sheet of bone, the anterior lamina, covers most of the side in all embryos studied, and it simply fuses later with either the periotic in monotremes, or the alisphenoid in marsupials and placentals. Hence, the braincase of the Late Triassic morganucodontids could be ancestral to both modern patterns. Within a monophyletic Mammalia, it is hard to arrange the various Mesozoic forms into a straightforward cladogram (illustration II)). Recent analyses (Lucas and Luo, 1993; Rowe, 1993; Wible etal., 1995; Luo etal., 2001a, 2002; Woodburne etal., 2003) indicate that Adelobasileusand Sinoconodonare basal forms, probably followed by the morganucodontids and kuehneotheriids. The Middle Jurassic forms (Docodonta, Triconodonta, Symmetrodonta) represent a broad radiation, whose positions depend on conclusions about the locations of the extant groups and the multituberculates. There has been controversy over the relationships of multituberculates to the three living mammalian clades. Kemp (1982, 1983) linked the three living groups in a clade, with the Multituberculata as the outgroup of all three, or perhaps the Multituberculata and Monotremata as sister groups. Rowe (1988) suggested that Multituberculata are more closely related to living therians than to monotremes. Luo et al. (2001, 2002) make a strong case that the monotremes are part of a southern radiation of tribosphenic mammals, the Australosphenida, that is quite distinct from the northern tribosphenic mammals, the Boreosphenida (Kielantherium plus Metatheria and Eutheria). They argue then that the 'tribosphenic' molar evolved twice. This view is rejected by Woodburne et al. (2003), but Archibald (2003) equally firmly rejects the latter work. In either case, these morphological results are opposed to some mitochondrial molecular analyses (e.g. Janke et al., 1997) that link monotremes and marsupials in a clade 'Marsupionta' to the exclusion of placentals. Luo et al. (2003) link Deltatheroida with Marsupialia, together making the clade Metatheria. This view is not represented here, but rather their earlier (Luo etal., 2001a, 2002) view of Deltatheroida as sister group to Theria. Read more about Mesozoic mammals at http://home.arcor.de/ktdykes/meseucaz.htm and http://www.toyen.uio.no/ palmus/galleri/montre/english/m_tidligpattedyr_liste_e.htm. II Cladogram showing the postulated relationships of the major groups of mammals, and of the Mesozoic groups In particular, based on the work of Luo etal. (2001a, 2002, 2003). Synapomorphies: A MAMMALIA, well-developed jaw articulation between squamosal and dentary, double-rooted cheek teeth, medial wall of orbit enclosed by orbitosphenoid and ascending process of palatine, expansion of brain vault in parietal region, squamosal large, tabular bone absent, occipital condyles large and separated by a notch or groove, trigeminal nerve exits all in anterior lamina of petrosal and well behind alisphenoid, alisphenoid makes broad contact with frontal; B, petrosal promontorium; C, cheek teeth divided into premolars and molars, mandibular symphysis reduced, diphyodont dentition (juvenile and adult only); D HOLOTHERIA, main cusp and accessory cusps of molars arranged in a triangle, hypoconid present; E, jugular fossa absent, paroccipital process extending ventral to cochlear housing; F, overhanging medial ridge above postdentary trough absent; G AUSTRALOSPHENIDA, tribosphenic molars with continuous and shelf-like mesial cingulid that extends to the lingual side of the molar rather than cingulid cusps, ultimate lower premolar with fully developed trigonid, transversely wide talonid, talonid placed posterior to the trigonid; H THERIIMORPHA, postdendary trough absent, separate scars for surangular/prearticular absent, Meckelian sulcus vestigial or absent, pterygoid fossa on dentary present, medial pterygoid shelf present; I THERIIFORMES, acromion process of scapula strongly downturned, proximal head of humerus is spherical and inturned, proximal head of femur ball-like, inturned and set off on a constricted neck, calcaneal tuber is longer than wide; J TRECHNOTHERIA, hypertrophied postvallum/prevallid shearing mechanism, squamosal with postglenoid depression, petrosal, post-tympanic recess present, caudal tympanic process present, atlas rib absent in adults, moderate torsion (30°-15°) of humerus, pelvic acetabulum with complete rim (without cotyloid notch), greater trochanter directed dorsally; K CLADOTHERIA, angular process of dentary well-developed and posteriorly positioned, paraconid shorter than metaconid, talonid has at least one cusp, interclavicle absent; L PROTOTRIBOSPHENIDA, broad contact between alisphenoid and frontal, cochlea is elongated and coiled up to 360°; M BORESOSPHENIDA, absence of postdentary trough and scars for the postdentary bones (except coronoid) in the dentary, tribosphenic molars, talonid placed posterior to the trigonid on lower molars, distinctive cingulid cuspule; N THERIA, tribosphenic molar, anterior lamina of prootic is absent, acetabulum bears an inverted U-shaped articular region for the femoral head, astragalus with distinctive neck, calcaneum with enlarged sustentacular process. Sinoconodon from the Lower Jurassic of China (Figure 10.6(b, c)) also appears to occupy a basal position in mammalian phylogeny (Crompton and Luo, 1993;Luo et al., 2001). It shows all the braincase features (Figure 10.6(b)) seen in Adelobasileus, and the rest of the skull shows a fully developed jaw joint between the dentary and squamosal and a fully developed petrosal promontorium for the inner ear cochlea. These are the classic mammalian characters. The back part of the skull is expanded (Figure 10.6(c)) and the orbit and lower temporal fossa are a single opening, bounded by a slender zygomatic arch. The cheek teeth, however, did not occlude precisely. Some posterior cheek teeth appear to have been replaced during life, accompanied by sustained, slow growth of the skull late in the individual's life (Luo et al., 2001b). These are primitive features of the indeterminate growth of cynodonts. The morganucodontids were a family of mammals known mainly from the Lower Jurassic of Europe, North America, China and South Africa, but with a late survivor in the Middle Jurassic of England. 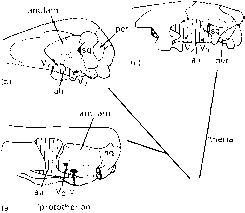 The skull of Morganucodon (= Eozostrodon) from the Lower Jurassic of England and China (Figure 10.6(d-h)) shows all the mammalian characters of Adelobasileus and Sinocon-odon. It retains greatly reduced reptilian jaw bones, including the reptilian quadrate-articular jaw joint, but these elements now function largely as part of the middle ear system (Figure 10.6(f, h)), with the mammalian squamosal-dentary joint as the principal jaw hinge. The braincase of Morganucodon (Figure 10.6(h)) also shows all the features of Adelobasileus and Sinoconodon. The lower jaw of Morganucodon (Figure 10.6(d, g)) is composed almost solely of the dentary bone, but the posterior bones are still present: a reduced splenial and coronoid, and a rod comprising the surangular, prearticular, angular and articular. Morganucodon has rather derived teeth with several changes from those of the advanced cynodonts and Sinoconodon. The cheek teeth are divided into premolars and molars (Figure 10.6(d)), as in later mammals. Morganucodon appears to have diphyodont ('two-type teeth') tooth replacement, with only a juvenile, or milk, set of teeth replaced once by the adult set. Sinoconodon retained a reptilian pattern of several tooth replacements during its life. Milk molars are present in the juvenile dentition and then replaced by permanent premolars, and the true molars are present only in the adult dentition. The cheek teeth of Morganucodon all occlude and wear surfaces can be seen on the incisors as well as on the cheek teeth. The main chewing movement in Morganu-codon followed a triangular route, rather than being simply up and down, as in advanced cynodonts, The lower jaws are narrower than the upper jaws, the anisognathous condition, typical of most mammals, and an adaptation for chewing the food on one side of the mouth at a time. Morganucodon sheared its food by the longitudinally-cutting crests on the teeth. The skeleton of Morganucodon is poorly known,but its close relative Megazostrodon from South Africa (Jenkins and Parrington, 1976) has a long low body, rather like that of Oligokyphus, but the limbs are rather longer (Figure 10.7(a)). The ribcage is restricted to the thoracic vertebrae, with no ribs on the lumbars (cf. Figure 10.2(a)). The forelimb and shoulder girdle (Figure 10.7(c)) are rather cynodont-like, still sprawling, whereas the pelvis and hindlimb (Figure 10.7(d)) are typically mammalian. The posture is erect, the ilium is a rod-like element pointing forwards and fused to a reduced pubis and ischium, and there is a very large obturator foramen, a circular gap in the pelvis between the pubis and ischium, seen also in earlier cynodonts. The femur (Figure 10.7(e)) is also mammalian, with a ball-like head that fits sideways into the acetabulum, a necessary feature in an erect animal and seen also in dinosaurs and birds (see pp. 143-4).In addition, there are two clear processes on either side, the minor and major trochanters, which provided sites for insertion of the important muscles that moved the leg back and forwards during walking and permitted squatting, a common posture in small mammals in which the hindlimbs are flexed beneath the body. movements, even if sustained running might have been difficult. The well-developed pointed cutting teeth suggest a carnivorous diet, and the small size of these animals points to insects as the main food source. Morganucodontids, unlike contemporaries such as tritylodontids and Sinoconodon, show a narrow range of body sizes and hence probably had determinate growth, a typical mammalian character. It is also most likely that the morganucodontids were endothermic (fully warm-blooded) and nocturnal. Other mammalian characters include the large brain and probable possession of mammary glands. What is the evidence for all these features, some of which are not obviously fossilizable? Endothermy, the generation of heat and control of body temperature by internal means (see p. 219), is indicated by several lines of evidence (Crompton et al., 1978). First, Morganucodon resembles modern insectivorous mammals in its body size and proportions and it has a fully developed secondary palate, as in most cyn-odonts, which allowed these animals to breathe rapidly while feeding as the air stream was separated from the mouth. How could Crompton et al. (1978) say that mor ganucodontids were nocturnal in habits? Morganu-codon has a greatly enlarged brain when compared with typical cynodonts, and the enlargement has mainly affected key elements in the senses of hearing and smell, both of which are useful for a nocturnal animal. Further, primitive living mammals tend to be nocturnal, and hence avoid competing for food with birds and lizards and, in some cases, can avoid heat stress. Finally, did Morganucodon have mammary glands? If it had hair, it may have had sweat glands to dissipate excess heat. Mammary glands are thought to be modified sweat glands. A second line of argument relates to the precise tooth occlusion of mammals and the fact that Morganucodon is probably the first mammal with diphyodont tooth replacement. Mesozoic mammals, like modern ones, probably delayed the appearance of their teeth until rather late when the head was near to its adult size, thus indicating that the young fed on milk. Mammals, then, need only two sets of teeth, the milk and the adult, during their lives.